CAWL has started the New Year off with a bang, helping to plan an exciting four-day event for the 20th Anniversary of World Spay Day! We’re so excited to be partnering with Denver Dumb Friends League, Denver Animal Shelter, and Downtown Animal Care Center to provide FREE cat spay/neuter and discounted dog spay/neuter for this worldwide campaign. 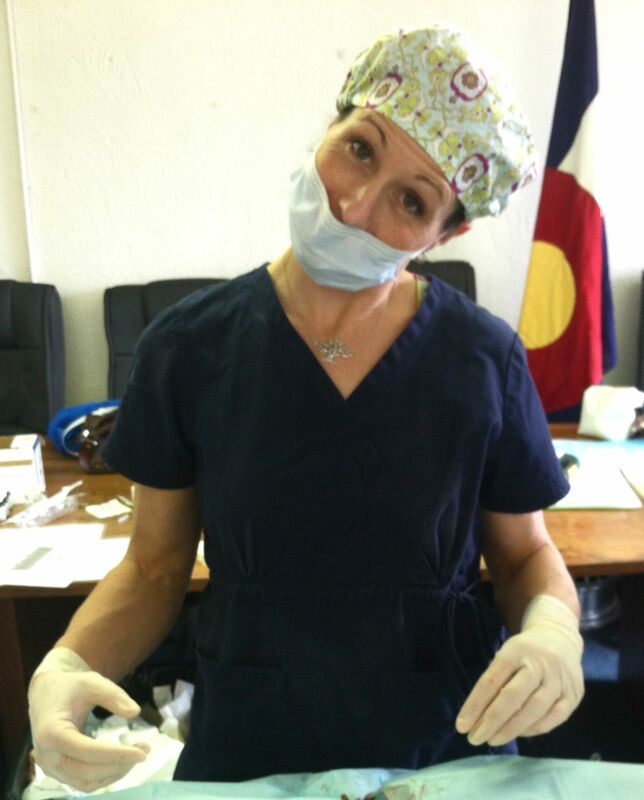 This is our first year being a part of World Spay Day, so we are thrilled to be able to participate. We are also super excited about using our brand new (to us) mobile spay/neuter unit- the SNOW Mobile (Spay Neuter On Wheels) with our awesome vet, Dr. Emily Hays! 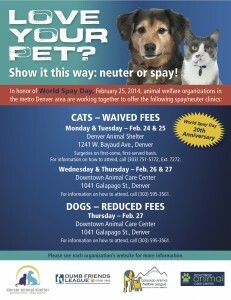 On Monday and Tuesday, February 24th and 25th, CAWL and DFL will be at Denver Animal Shelter (1241 West Bayaud Avenue, Denver, CO 80233), offering FREE spay/neuter for cats, with vaccinations included (limit three cats per household, cats must be 2 pounds to undergo surgery). No appointment is necessary, but we are expecting a high volume for this event so get there early, as it is first come, first serve! Check in begins at 7:30 a.m. All cats must be in carriers (no boxes, please). This event continues on Wednesday and Thursday, February 26th and 27th at a second location, Downtown Animal Care Center (1041 Galapago Street, Denver, CO 80204). CAWL will have the SNOW mobile, and will be providing FREE cat spay/neuter surgeries and vaccinations on both days with no appointment necessary (limit three cats per household, cats must be 2 pounds to undergo surgery). This is a first come, first serve event as well, with check in starting at 7:30 a.m. All cats must be in carriers (no boxes). Downtown Animal Care Center will be providing low cost dog spay/neuter surgeries are available Thursday the 27th by appointment only. Please call Downtown Animal Care Center at (303) 595-3561 or visit downtownanimalcarecenter.com for more information on dog spay/neuter for this event! Space is limited so please don’t delay! We would love it if you would share this with your friends and family in the metro area. Our goal is to fill up each day, and really make a difference for this amazing campaign. If you love your pets, spay and neuter them! Hello I’m trying to find affordable spay an neutered for my kittens that I reached from bad situation and we’ve started having peeing problem I’d also Like to get them vaccinated there 13 weeks.